As Winter turns to Spring, the risk of Spring grass related laminitis is a concern. Many of us need to become aware of the type of grass our horses are grazing on. I live in Linn County, Oregon, the Grass Seed Capitol of the World, (truly). Fescue Grass, some varieties of which were developed locally, is known for its durability and high sugar content which cows and horses love and thus it is commonly used in pastures and hay fields in this area and in other areas in the United States. After one of my horses developed laminitis, I had the opportunity to be part of the University of Minnesota study on laminitis. Part of that study included taking random samples of the pasture grass and of the hay that I was feeding. The results amazed me. The sample of grass taken in late March showed my pasture was 24% combined sugars and starches. My hay was just the local valley fescue mixture that I’d been feeding for years, with no problems for other horses. It is abundant, and is available at a reasonable price. Analysis showed that it was also 23% combined sugar and starches! I had no idea. (Average sugar and starch content in horse hay or winter grasses is about 10-15%) For every 20 pounds of hay I was feeding, my horse was eating about 5 pounds of sugars and starches. For every couple of hours of grazing on my pasture spring grass, my horse was getting about 5 pounds more sugars and starches. Imagine a whole day grazing! Her digestive system could not adjust, and laminitis developed. So what have I changed? She now gets Teff hay, known for its low sugar/starch content, I monitor her weight throughout the year, I also limit grazing from March-June, using a muzzle, and grazing only for a short time in the early morning or late evening (times of lower sugars). Basically she’s in a dry lot. I also feed her an A.M. and P.M. serving of Yea-Sacc throughout the spring season to help balance her gut pH. She gets treated differently than the rest of the herd, but she’s worth it! 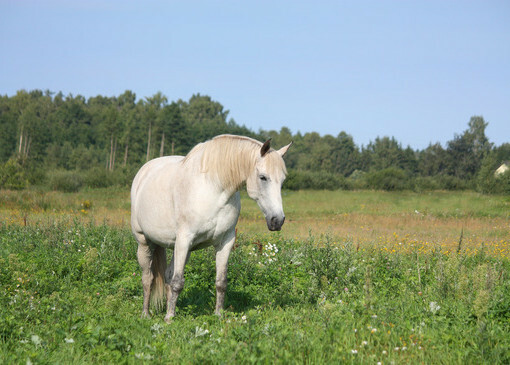 Why can spring grass cause laminitis problems? Spring grass is a diet change for the horse. It is lower in fiber, but higher in protein, sugars, and moisture than hay or winter grasses. When spring grass is abundant, and horses are eating as much as they can, as fast as they can, the grass may not remain in the small intestine long enough for these nutrients to be completely digested and absorbed. This partially digested matter spills over into the cecum and colon. The cecum and colon’s beneficial bacteria take time to adjust to diet changes and these rapidly fermenting grasses can lead to bloating (gas), diarrhea and colic. In extreme cases, it can lead to an inflammation of the intestinal wall, which poses a risk for laminitis. How can Yea-Sacc help with Spring Grass laminitis problems? Yea-Sacc® is a live yeast culture that can help reduce the risk of horse colic, gas, and laminitis by helping prevent the acidic conditions that spring grass can cause in the large intestine. It stabilizes the gut pH so that the beneficial bacteria can cope better with dietary changes.